Taylored is a design and fabrication shop in Oakland, California. We create custom furniture and interiors for Bay Area clients. We're proud to work with everyone from tech companies to restaurants to homeowners. Taylored was founded by Paul Gregory Taylor. My life-long interest in the ways we interact with physical structures has taken a variety of forms. I hold an MFA in sculpture from UC Davis, I have worked as a carpenter and steel fabricator, and I have a background in architecture and design. This diversity of skills and perspectives allows me to approach a project from many angles—from generation of ideas and design through hands-on fabrication. Merging aesthetic and practical considerations with a deep knowledge of building materials, I provide clients with a holistic experience. I love the collaborative aspects of working with a client to meet a specific challenge. I find working with a set of parameters—budget, materials, and desired function to name a few—to stimulate rather than stifle creativity, leading to solutions that are simple yet unique, practical yet beautiful. I work with materials that are unashamed to be themselves. I love the essential qualities that define the materials I select, from the swirling grain of a walnut board to the tensile strength of a steel tube. When choosing materials I prioritize sustainability and I create things that will hold up over time, both physically and aesthetically. 1. Design: After an initial meeting where parameters are discussed, we generate a series of design options. These are articulated using simple sketches, architectural drawings, and/or 3D modeling software. When a rough design is settled upon, we submit a bid for the project. After approval of the bid, we create a final design. 2. 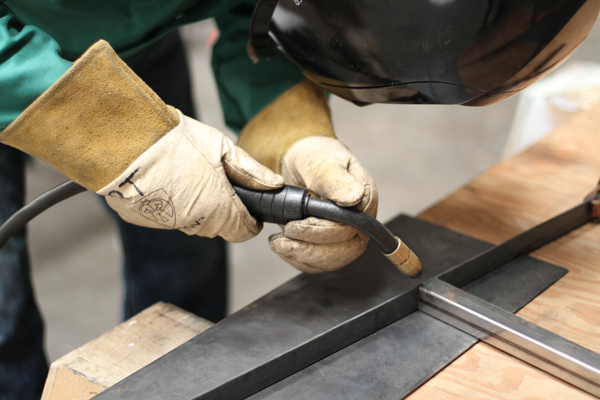 Fabrication: Most fabrication is completed in our shop. We have equipment to work with wood, welded steel, and cast concrete among other materials. 3. Installation: Often installation involves simply delivering a piece. However, in the case of built-ins and interiors, installation can be a bit more involved. We are conscientious about minimizing our impact on-site, whether it is a home, office, or other commercial setting.